Apply a small amount to damp hair before styling to smooth, hydrate, fight frizz and reduce drying time. Use a smaller amount on dry hair after styling for extra polish. Can also be used as a deep moisture treatment: Apply to damp hair, wrap in a plastic cap and leave on for 20 minutes, then rinse. Argania Spinosa Kernel Oil A plant oil extremely rich in tocopherols (Vitamin E). Excellent source of essential fatty acids and anti-oxidants. helps protect against damaging free radicals. 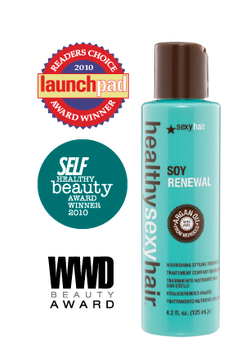 Soybean Extract Lightweight emollient that helps detangle hair and adds shine. Sunflower Seed Oil Lightweight oil that adds softness, smoothness and shine. - Repairs, strengthens and nourishes the hair. - Promotes shine and smoothes the hair. - Helps prevent breakage and split ends. 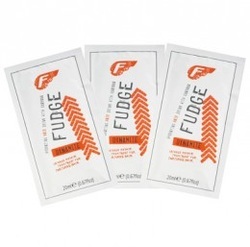 - Adds condition without weight, even to fine hair types. Fudge Colour Conditioning Treatments provide the hair with a renewed richness and shine, depositing subtle colour for brunettes and red heads as well as violet tones for blondes. 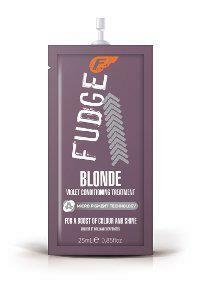 For use any time the Fudge Colour Conditioner will refresh and revitalise colour between services. Simply shampoo, remove excess moisture and apply, leave for up to 10 minutes and rinse well, styling as usual.